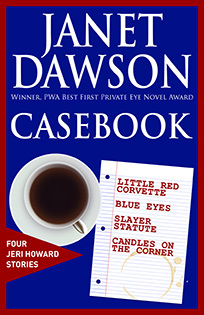 Also available is Casebook. 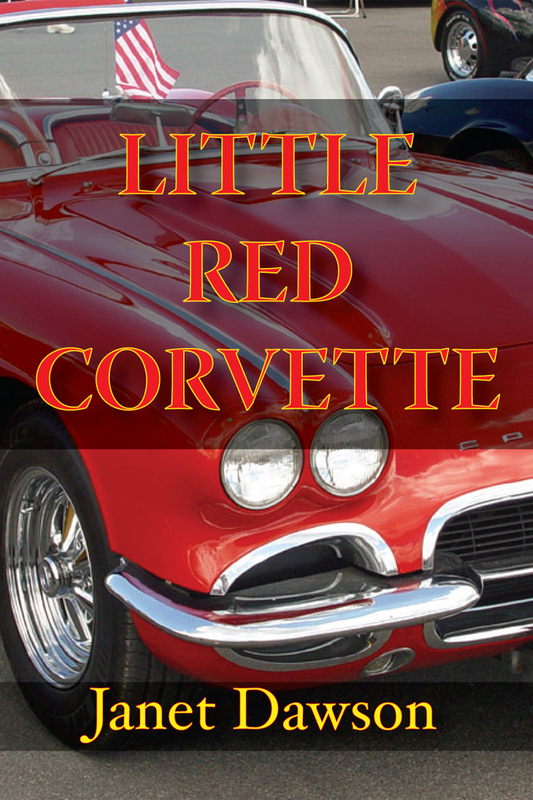 Together in one volume—four short stories featuring Jeri Howard: “Slayer Statute,” “Blue Eyes,” “Candles on the Corner” and “Little Red Corvette.” Buy it for Amazon’s Kindle. Twelve candles, one for each year of Emily Gebhardt’s life, stood in a row on the grassy strip between sidewalk and curb. Each evening, Emily’s parents lit fresh candles. The flames flickered like beacons in the darkness, burning out long before morning. At each end of the row were plastic vases filled with fresh flowers—roses, tulips, iris, daffodils—in Emily’s favorite colors, pink and yellow. A pink umbrella, its handle lengthened by a broomstick stuck into the ground, sheltered a small easel from the spring rain. The easel held a color photograph of Emily and a newspaper clipping. The shrine—that’s what it was, really—had been on the corner where I stood for the past month. I stepped up to the easel and examined Emily’s picture. 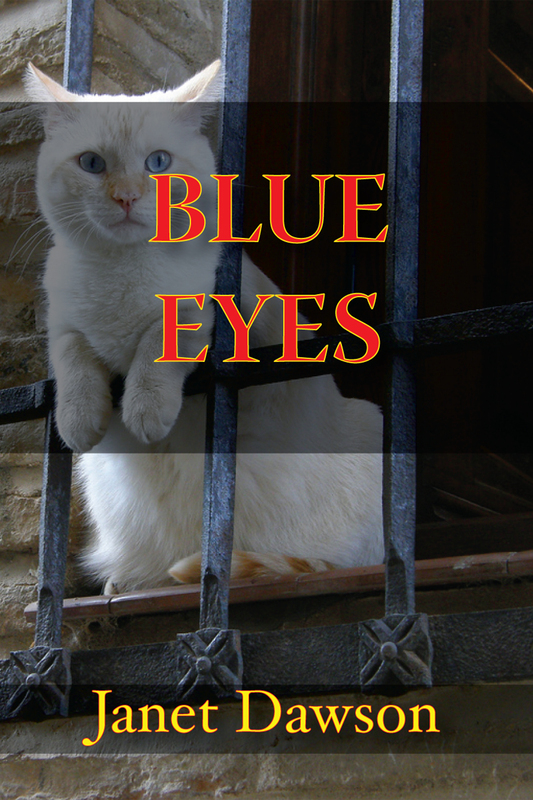 I saw wide blue eyes, a cheerful smile on a round face, and brown curls tied back with pink and yellow ribbons. Emily had been a pretty girl poised on the verge of adolescence, just twelve years old. She’d never see thirteen. Emily’s parents said most people in the neighborhood seemed protective of their makeshift memorial. But not everyone respected the shrine. Several times the Gebhardts had arrived with fresh flowers and candles to discover all the items missing. Not vandalized, just gone. Each time, they simply rebuilt the memorial to their daughter. I’d read the police report and talked with the investigating officer. On a Wednesday afternoon in April, Emily and two friends had just been released from the confines of the nearby middle school. They were crossing Grand Street at this corner when Emily dropped something. She went back to retrieve it. The witnesses all agreed on one thing—the vehicle that raced down Grand Street and smashed into Emily was going much too fast for a residential area, much faster than the 25 miles per hour limit posted all over Alameda. The impact tossed the girl into the air. She died a short time later. Now there were candles on the corner. The vehicle didn’t stop after hitting Emily. The driver sped down Grand Street and hung a left on Otis Drive, narrowly missing other pedestrians and cars, weaving in and out of traffic as it raced past the nearby shopping center. At Park Street the vehicle ran a red light and left squealing brakes in its wake. A few moments later a vehicle traveling at a high rate of speed crossed the drawbridge at the southern end of the island that is Alameda. Once it reached Doolittle Drive, the vehicle vanished. Perhaps the driver had turned right on Island Drive, or continued south, toward Oakland International Airport, or detoured onto Hegenberger Road or 98th Avenue to cut over to the freeway. When it came to a description, the witnesses diverged widely, as witnesses do. People saw a flash of silver, gold, blue, green, brown, red. 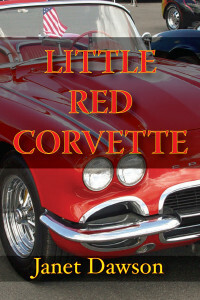 No one was sure whether the vehicle was big or small, a car or an SUV, what make or model. No one offered a description of the driver’s gender or appearance. No one could recall license plate numbers or letters, or whether they were California plates. No one knew where to find the vehicle or the driver who’d been at the wheel. Emily Gebhardt’s parents grieved, full of sadness, anger and frustration, dissatisfied with the slow progress of the police investigation. They wanted answers. They wanted someone to blame, someone to pay. So they came to me, Jeri Howard, private investigator working out of Oakland. I wasn’t sure I could give the Gebhardts what they wanted. But in the face of that much raw pain, I had to try. I took a small digital camera from my purse and shot photographs of the intersection, from different angles, then pictures of the shrine. As I lowered the camera, a woman came out the front door of the big two-story Victorian house on the corner. 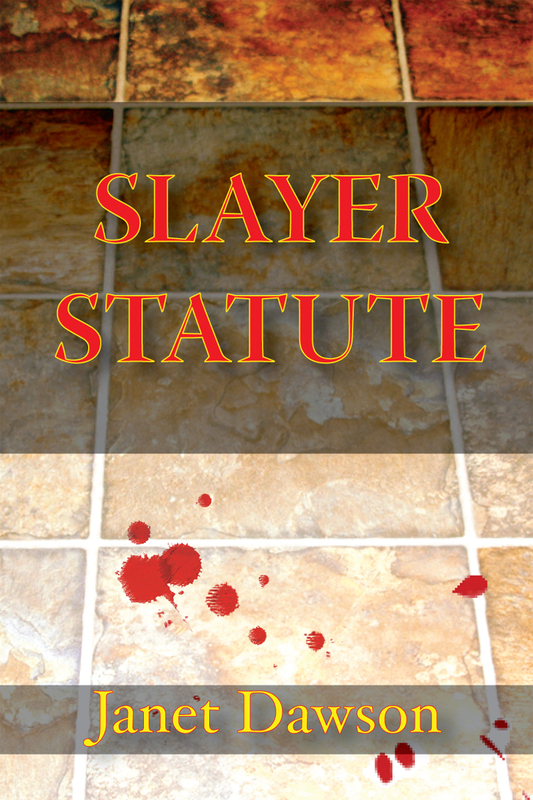 She stalked across the lawn toward me, a decidedly belligerent look on her face. “Are you one of those people who’s been leaving this stuff here?” she demanded. I guessed she meant the easel, the flowers, the candles on the corner. “A month is a short time when you’ve lost a child.” That’s the loss many people never get over. Okay, I was ready to declare her winner of the insensitivity sweepstakes. I guess she figured now that their only child’s funeral was over, the Gebhardts should just get a grip and go on with their lives. I handed her one of my business cards. She held it gingerly between thumb and forefinger as though she was afraid she might catch something. She backed away from me, sputtering angrily. “It’s my property. You tell those people I want that stuff gone, permanently. I’ve complained to the police and they won’t do anything. 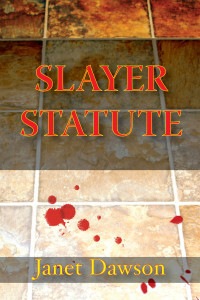 Next I’ll be talking to my lawyer.” She turned and stalked back to her house, slamming the front door for good measure. Talk about excessive. Her reaction to the shrine was just that. Why was she so discomfited by the memorial? Who was she?